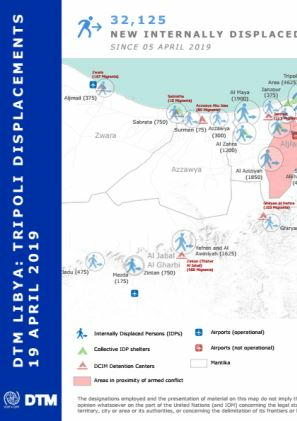 Approximately 990 migrants reportedly arrived in Benghazi in January 2019 looking for work opportunities. The security situation in most neighbourhoods of Derna remained stable during the reporting period, except the old city. 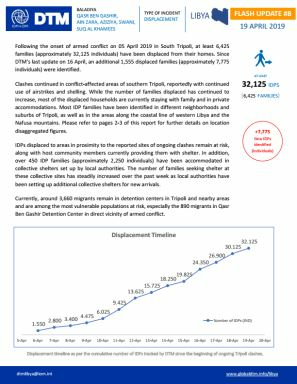 In January, an additional 185 individuals were reported to have returned to Derna, and their reported needs include food, NFIs, protection and medicine. An estimated 50 to 150 migrants arrived in Hrawa; some were looking for job opportunities whereas others planned to continue their journey to other destinations. An estimated 300 to 400 Migrants reportedly arrived in Sirt, coming from Ejdabia, Aljufra and Sebha. Some were reported to be looking for job opportunities, whereas others were planning to continue their journey to other destinations. 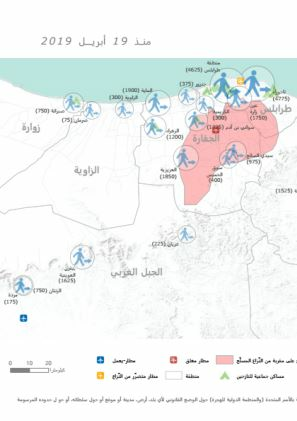 Approximately, 600 families were reported to have left their homes in Suq Alkhamees, Alasabaa and Qasr Bin Gasheer due to clashes South of Tripoli in mid-January 2019. Following the end of hostilities on 23 January, the families reportedly returned to their homes as the security situation stabilized. Approximately 130 families from Tarhuna were displaced to other neighbourhoods within the municipality due to the clashes in southern Tripoli in mid-January. 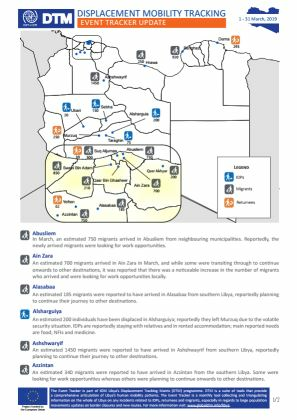 Some of the displaced families were reported to be staying with their relatives whereas others were staying with unrelated families amongst the host community; reportedly, most families returned following the end of hostilities.